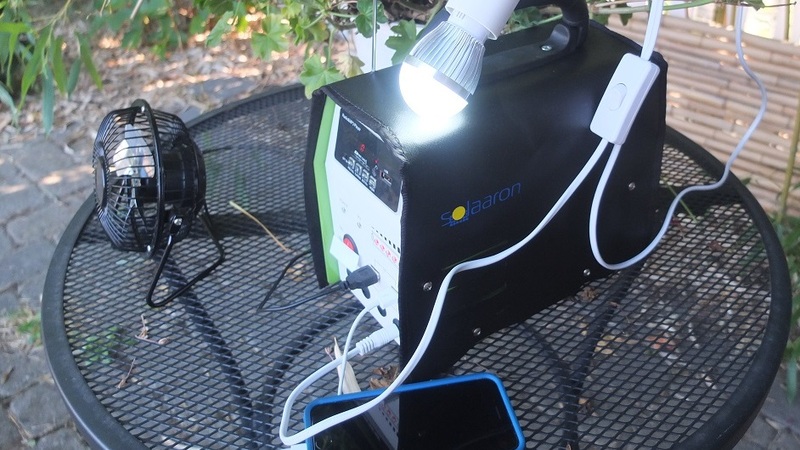 Blog - Spotlight: The Solaaron Illuminator, a pint sized solar generator…truly a thing of beauty. Spotlight: The Solaaron Illuminator, a pint sized solar generator…truly a thing of beauty. In today's world oversaturated with advertising and around the clock marketing, the Solaaron Illuminator is one item that may not get ENOUGH recognition for how amazingly useful it is. Near $300 or a pair of nice shoes, where else can you find a companion, a problem solver, a lifesaver and a portable technological miracle like this? And don't say your smart phone because those things end up being replaced every couple of years, and this thing lasts much longer! What can you do with the Solaaron Illuminator? Light up your home in a power outage for over 15-30 hours! Or light up your yard, barbeque, campsite, beach party, off-grid home…light up whatever you want! Charge your portable devices simultaneously! Charge multiple cell phones, your GPS, tablet, portable electric shower…YOU NAME IT. And do all this charging without interrupting your lights. Cool down with the included fan! Be it a hot summer day and the AC went out, or a muggy mosquito filled afternoon outdoors…GET THAT STAGNANT AIR MOVING. And do all this while you're running your lights and charging your cell phones. Listen to the radio or play your own music! Speakers and an FM Radio are built into the Illuminator, so you can scan the airwaves for important updates during an emergency, or kick back and enjoy some nice tunes while working the grill in your yard. You can also play DJ with your own personal mix because an MP3 feature is integrated as well. There would be no more need to scramble for candles and matches, or bulky and expensive batteries and flashlights during emergencies. It's clean, silent, portable solar power about the size of a shoebox and weighs in at under 20 pounds. It charges by solar panel in the sun within 6 hours or by adapter in under 3. There is nothing at this price like it. Nothing as practical, durable, high quality and backed by an established company located in the USA with knowledgeable and honest representatives. Everything is included, assembled and ready to turn on right out of the box : 2 Solar Panels, 4 Lights and 4 fifteen ft. lamp cords, 1 Fan, Radio/MP3, High capacity battery, 4 DC outlets, 2 USB outlets, Wall adapter. 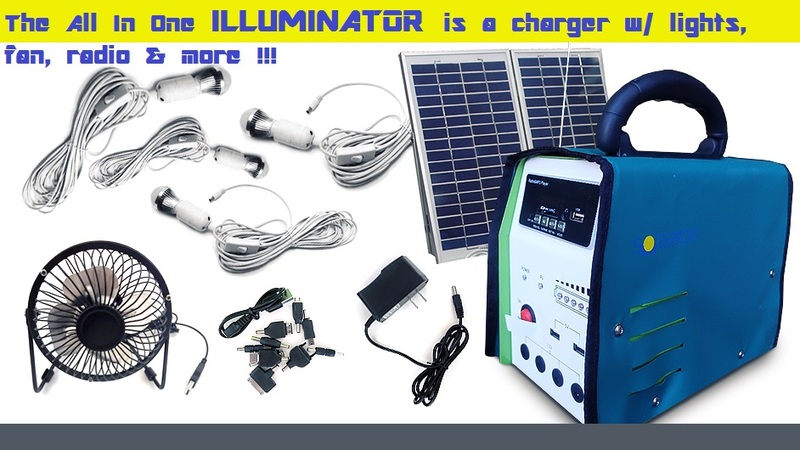 The Solaaron Illuminator Lighting System & Power Bank is an all-in-one compact solar generatorthat serves so many essential and practical purposes at such a low price point, making it a modern day must have. This lifesaving, leisure tool should be the solar "swiss army knife" of the new millennium.